59 or 60? 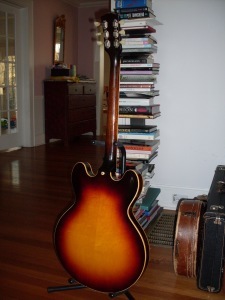 This guitar, which is not the one I’m talking about in the post, had all the 59 features including a big fat neck. But it is a 60 based on the serial number and the FON. 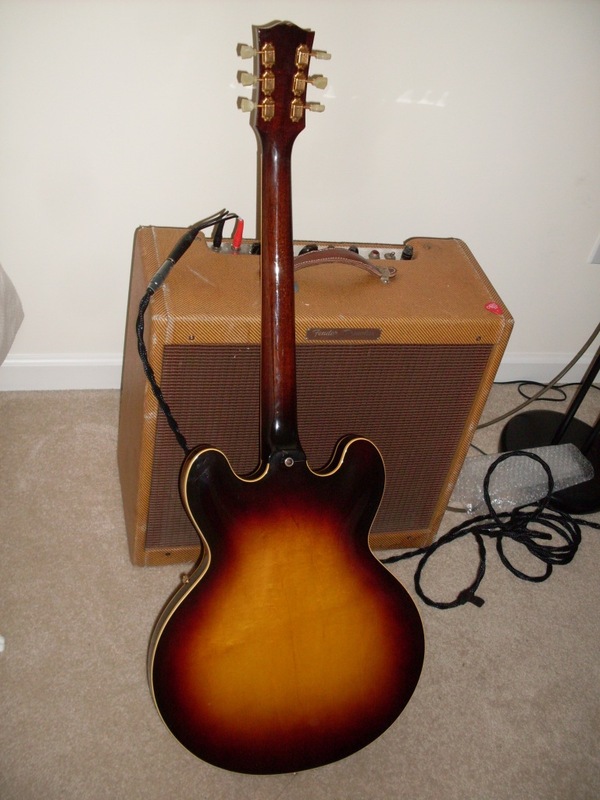 Yes, today I’m going to tell you what it was like to date in the 1950’s…Actually not even I’m that old but I can tell you about a dating problem I had recently with a dot neck ES-335. 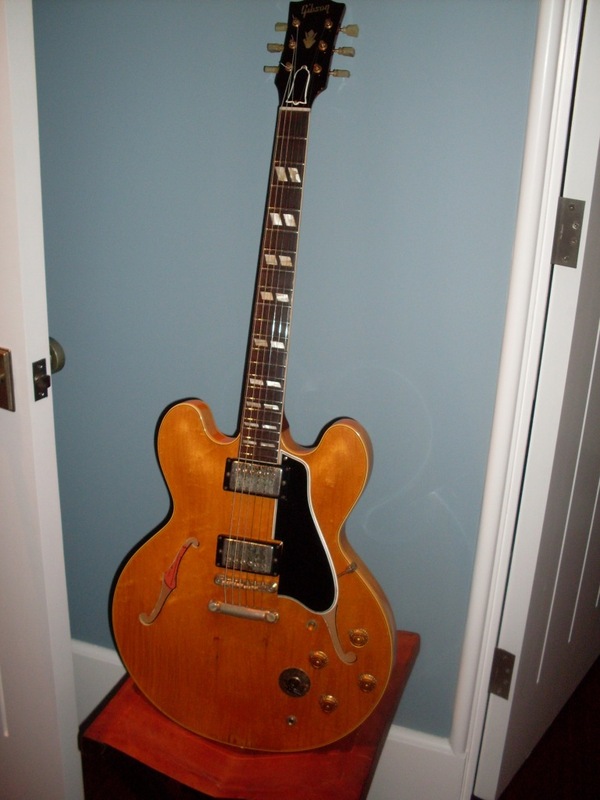 A well known and respected dealer has a ’59 dot neck ES-335 to sell. It’s beat up but, hey, it’s a 59, right? Well maybe not right. I emailed the dealer and asked a bunch of questions-like “what is the serial number, how big is the neck profile and are the tuners original?” I also asked that they try to locate the factory order number (FON) and even sent a photo in case they didn’t know where to look. I was assured that they had no doubt it was a 59 and that it couldn’t possibly be anything else. 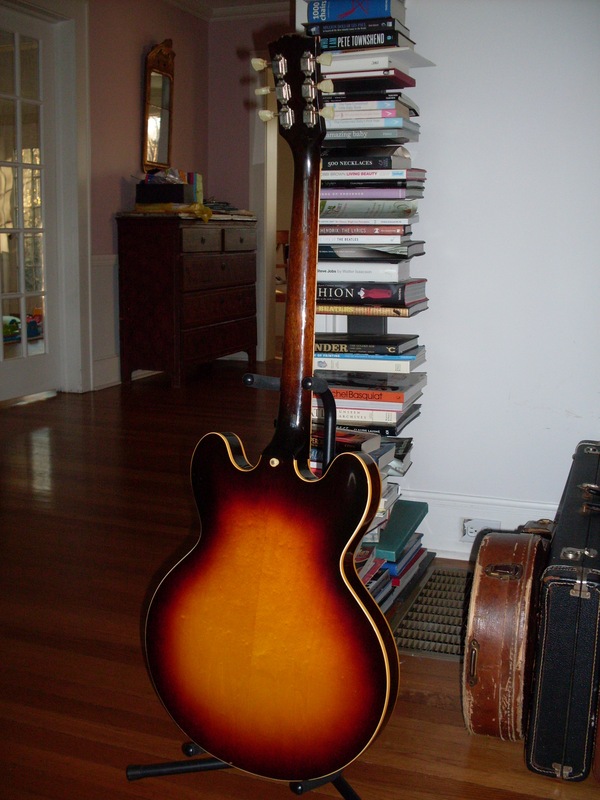 The neck profile is kind of small, the knobs are bonnets and the tuners are single ring, all of which say 59. Oh, and the label was missing. OK, it’s pretty well priced for a 59, so just get me the FON and we’ll talk. “Sorry, I can’t find the FON but the tech department assures me it’s a 59.” It has 37th week of 59 date codes on the pots. So, to review, the only features that tell us it’s a 59 are the knobs, the tuners and the pot codes. An early 60 will have those knobs and those tuners. Gibson didn’t have “model years” like a car. They made their changes when it suited them and always used up the old parts and transitioned in the new ones. So, how do we tell a late 59 from an early 60 and why do we care that much. Well, we shouldn’t really care that much-an early 60 and a late 59 are the exact same guitar. Same build quality, same builders, same pickups and so on. But the vintage market has decreed that a 59 is better than any other year and therefore requires that you pay a premium for the privilege of owning one. I don’t make the rules but I can’t dispute that a 59 is easier to sell, commands a higher price and comes with a set of bragging rights only surpassed by owning an original Les Paul burst. Everybody wants a 59. I could argue that 58’s have some real advantages but that’s a whole ‘other post. So, back to the guitar in question. It could be a 59. It could be a 60. Using the knobs and the tuners as an absolute dating feature is unreliable. They can be changed and that doesn’t even matter here since those knobs and tuners are correct for both years anyway (until some time in the Spring of 60). So, there are a lot of 60 ES-335’s that fit the description. But what about those pot codes. The 37th week is sometime in mid September. I’ve seen earlier pots on a 60. The pot codes really only tell us that a guitar can’t be earlier than the pot code date. Because the pots were ordered in large numbers, the idea that a pot sat around for as few as 16 weeks is not even remotely out of the question. I’ve seen ’66 pot codes in 68. I’ve seen 1954 pot codes in 1958. 16 weeks is nothing. My conclusion is that in the absence of a serial number of FON, you can’t (and I can’t) tell a late 59 from an early 60. There is one other possibility and this guitar doesn’t have it. An original sales receipt. Without these things, it should be priced like an early 60. Simply put, pot codes are no good for dating a guitar with any accuracy-they only tell you the earliest build date and not the latest. One other point-if it had a 59 FON, it could still be a 60. I go by serial number when dating a 3×5 but I always mention the FON if it differs-as in “it’s a 1960 but construction began in 1959 as indicated by the 59 FON. Or, it’s a 1959 serial with a 58 FON. You get the idea. Fortunately, most FON’s are visible and I wouldn’t be surprised if this guitar has one somewhere. The position of the FON can be almost anywhere-it was put there before the guitar was built. Sometimes you have to look a little harder. 345’s count too. This blondie had a 59 FON and an early 60 serial number. I called it a 60 although plenty of dealers would call it a 59. I’m not really sure who is right, so disclosing both is a good solution. It doesn’t get much rarer than this. 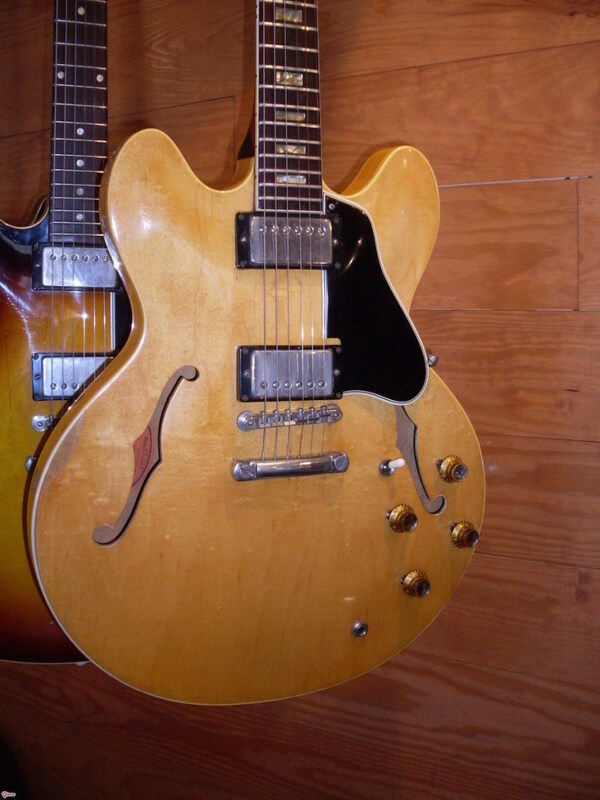 This is the only known 63 stop tail ES-355 Mono (or stereo, for that matter). If perhaps you know of another, I’d like to know about it. Thanks to Roger in California who was kind enough to offer this beauty to me. I was so close to getting this one last time it sold. Those of you who live in the East have noticed that Spring has taken a vacation. It was warm for a minute and a half in March but Winter isn’t letting go. My beautiful magnolia trees were just blooming and bam!, 14 degree weather and all the flowers are dead. Bummer. This has nothing to do with the post but I’m pretty bummed about those trees. So, warm April days have been rare this year and rare is the subject today. You know, if you read my posts regularly, that I love the rare stuff. I’ve had the most unbelievable luck finding rare 3×5’s over the past year. I’ve found two of the four black 59 ES-345’s, a factory blonde 63 block neck 335, a red 59 dot neck with a a factory Varitone, three blonde 335’s and three stop tail 355’s. Now, I’ve got the only stop tail 63 ES-355 known. This guitar is a pretty interesting story on its own. There are only 6, maybe 7 known stop tail ES-355’s. I’ve now owned 4 of them. A stereo 59, a mono 59, a stereo 60 and now a mono 63. My friend Tom in Texas has a mono 60 (and the stereo 60 that I had). There’s a stereo 60 in Sicily and that’s about it. There are probably a few that haven’t surfaced yet but it’s still one of my “holy grail” guitars, especially the mono ones. The stop tail 63 showed up on Craigslist (if I’m recalling correctly) in North Jersey three or four years ago. I got on it right away and made what I though was a fair offer. The seller apparently thought so too and agreed on the price. This was a Friday. I told him I would make the drive on Monday to pick it up. I had a conflict and asked if I could pick it up Tuesday. He told me he had gotten a better offer and it was sold. I would have gone higher (I really wanted this guitar) but he said the deal was done. I thought the deal with me was done three days earlier but sometimes integrity goes out the window when an extra grand flies in. A couple of days later, one of my most avid readers tells me how he scored a 63 stop tail 355. I couldn’t blame him-he didn’t know that the seller had already accepted another deal. I immediately started my subtle campaign to get this guitar from him. Four years later (more or less), in an email with the subject line “temporary insanity”, the 63 stop tail was offered up to me. I dropped a hefty 40% markup over what he paid and the guitar was mine. At least for now. And it’s just great. Of course, I’ll sell it but I’ll play it and get to know it for awhile before I do. Once again, I have to go back to the old rule…something about not falling in love with guitars. ’59 ES-345 in red. The first red one made. ’59 red dot necks-I’ve had two-one with a Bigsby and a stop tail with a factory Varitone. A Pelham Blue Trini Lopez, two black 59 ES-345’s, a blonde block neck 63, four stop tail ES-355’s, two blonde ES-345’s, that little blonde ES-140 with the PAF and 8 blonde ES-335’s. I was also lucky enough to find a 59 dot neck with a pair of reverse zebra pickups. Oh, and the white 65 ES-355. 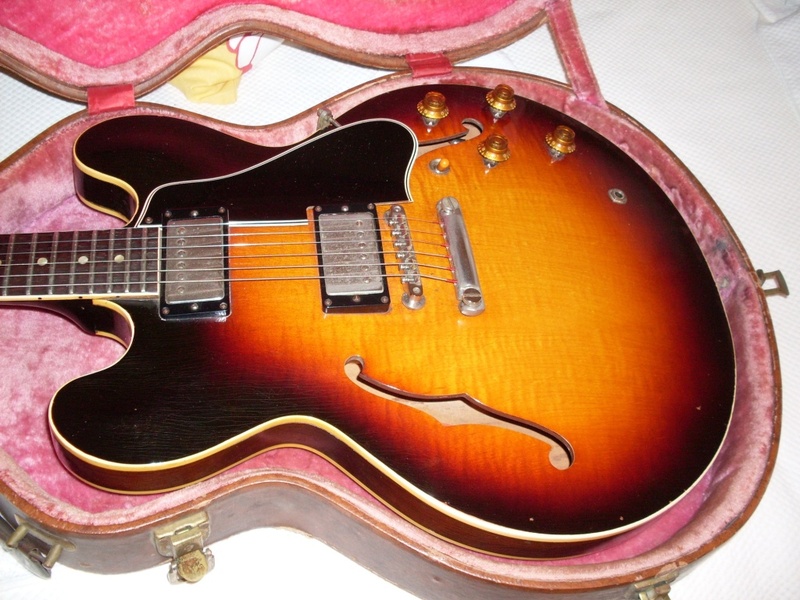 Then there’s “The Mexican” which is one of perhaps two or three cherry sunburst stop tail ES-335’s made in 1965. I would have kept every last one of them if i could afford to. They have all been great. Some better players than others for sure, some prettier than the others but ll interesting and, oh yeah, rare. To many collectors, rarity doesn’t matter much. If the model isn’t popular, then rarity doesn’t matter at all. I’ve had two of only 11 blonde Byrdlands made in 1961 but they are really not worth much-rare or not. Why? Because nobody seems to want archtops these days. But when you get a rare version of a sought after model, it’s a different thing all together. They command a pretty serious premium and you start getting emails from billionaires and rock stars. Nice to know people are paying attention. They didn’t make any block neck 335’s in blonde. Except this 63 and a lefty 64. One of my favorite rarities. This came out of Scotland. 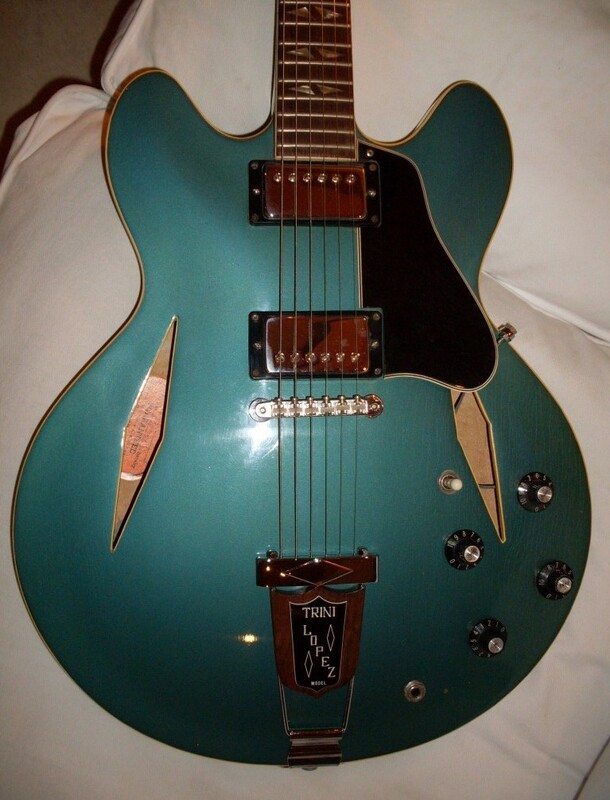 Then there’s this 67 Pelham blue Trini Lopez I had back in 2010. Near mint. Bought it off of Ebay. I think there are 16 of them. Not a great player but it sure looked cool. Most sunbursts have a dark heel but the rest of the neck is lighter. But there are exceptions. 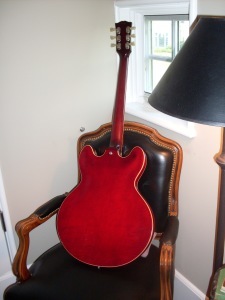 Lots of aspects of any guitar made by Gibson in the 50’s and 60’s are going to be inconsistent but nothing raises suspicion like a dark finished neck. There are a few variations of this but all of them tend to bring up more questions than they answer. I’d like to try to dispel some of the fear. Some have dark paint at the headstock as well. That’s less usual but still fairly common. It would appear that the QC folks at Gibson had a problem with wood. Specifically, things like knots or weird grain. They didn’t like to see these things and would take evasive action when a piece of less than perfect wood was used on one of their guitars. The guys in the paint department were, I would guess, told to minimize things like this by covering them up with paint. We’ve all seen Gibsons with dark heels, dark headstock backs and even completely dark necks. There were also stingers-heel and headstock to cover blemishes and marginal wood. The question is usually “…what are they hiding? Is there damage under there? Is it factory or an aftermarket repair? Most reds are completely consistent color-wise. This one has a dark heel, however. 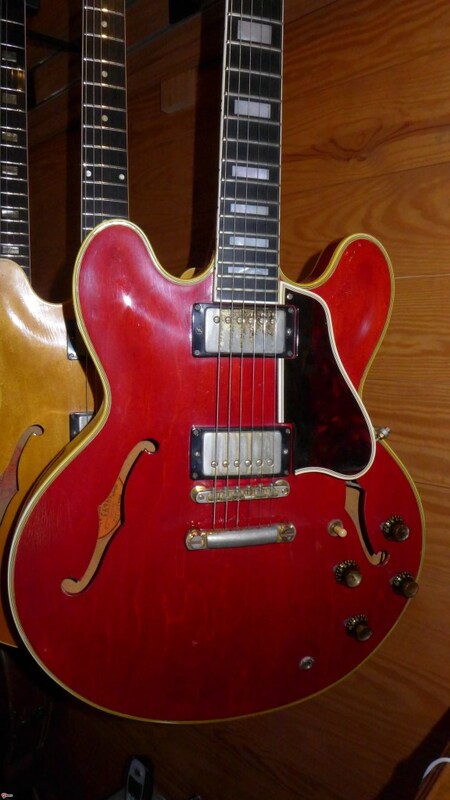 Dark heel and dark headstock is a rare thing on a red 335 but they do exist. finish off these guitars, I’ll probably never know for sure what’s under there. Here, the black light is your friend. If the finish is original, then don’t worry about what’s under there. Bad grain doesn’t make for a bad neck. If an opaque finish doesn’t black light correctly, then you want to do some further investigating. The red ones are more consistent. The dark heel and headstock are rare, at least in the early ones. You see a few more by the late 60’s. The neck is usually somewhat different looking color-wise than the body but that’s due to the difference in the wood. Mahogany is darker than maple and the red dye reacts differently resulting in a bit more brown color in the neck. The dark heel and headstock seems more common on SG’s although I can’t tell you why. I went through my archives of red ES’s (there are about 100 of them in there) and probably 85% were consistent color-wise. 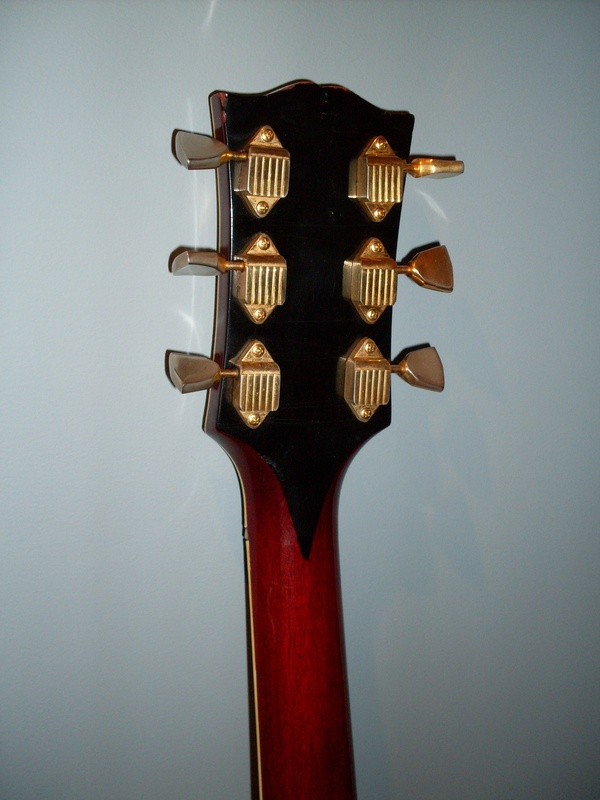 A few had stingers (mostly 355’s) and really just a handful had the dark red finish at the heel and/or headstock. I think the best approach to a darker neck is to get out the black light. If any funny business shows up, question it and decide whether it’s a big enough issue to make you walk away. And use a little logic. If it looks wrong, it probably is. You can’t get burned if you walk away. The stinger may or may not be hiding something but they look pretty cool so nobody complains. Usually on a 355 or blondes.